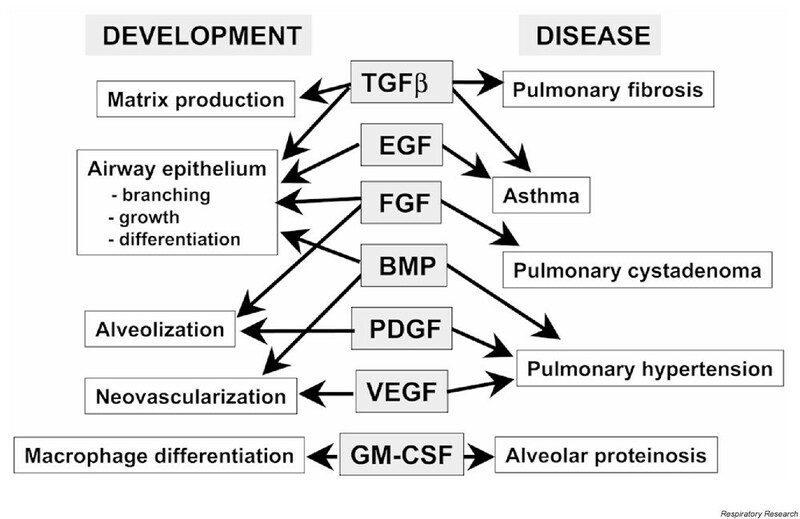 Growth factors in lung development and disease: friends or foe? Growth factors mediate tissue interactions and regulate a variety of cellular functions that are critical for normal lung development and homeostasis. Besides their involvement in lung pattern formation, growth and cell differentiation during organogenesis, these factors have been also implicated in modulating injury-repair responses of the adult lung. Altered expression of growth factors, such as transforming growth factor β1, vascular endothelial growth factor and epidermal growth factor, and/or their receptors, has been found in a number of pathological lung conditions. In this paper, we discuss the dual role of these molecules in mediating beneficial feedback responses or responses that can further damage lung integrity; we shall also discuss the basis for their prospective use as therapeutic agents. Growth factors are diffusible proteins that act within a short distance of where they are produced to induce a variety of cellular activities through activation of diverse signaling pathways. While their function has been traditionally associated with promotion of cell proliferation, these factors are increasingly recognized as important mediators of tissue interactions in the developing and adult lung. During organogenesis they act as signaling molecules, establishing feedback responses between germ layers. By forming gradients along a developing structure, growth factors help to define signaling centers that control the behavior of neighboring cells. In the developing lung, growth factors specify patterns of branching, and control airway size and cell fate, among other functions. As a general rule, growth factor signaling mediated by tyrosine kinase receptors (such as fibroblast growth factor [FGF], epidermal growth factor [EGF], vascular endothelial growth factor [VEGF], and platelet-derived growth factor [PDGF]) promotes cell proliferation and differentiation, while signaling by serine-threonine kinase receptors (transforming growth factor [TGF]β family members, such as TGFβ1, and bone morphogenetic protein [BMP]4) opposes these effects (reviewed in [1,2]). In the fully developed lung, these signals are presumably balanced to maintain cellular activities at equilibrium, so that normal lung structure and function are preserved. The existence of such a balance has been inferred from the abnormal expression of these factors or their inappropriate signaling activation in pathological lung conditions. Growth factor imbalance thus describes a situation in which the expression or activity of a factor predominates over another, usually of opposing effect, within the same system. While growth factors are key regulators of alveolar formation, they have also been implicated in abnormal lung remodeling that results in fibrosis and changes in the architecture of the airspaces (see Fig. 1). An analysis of their role in development and disease follows. Growth factors in development and disease. Major roles of selected growth factors in embryonic and postnatal lung development (left) and their potential association with lung pathological conditions (right) are shown. BMP, bone morphogenetic protein; EGF, epidermal growth factor; FGF, fibroblast growth factor; GM-CSF, granulocyte macrophage-colony stimulating factor; PDGF, platelet-derived growth factor; TGF, transforming growth factor; VEGF, vascular endothelial growth factor. 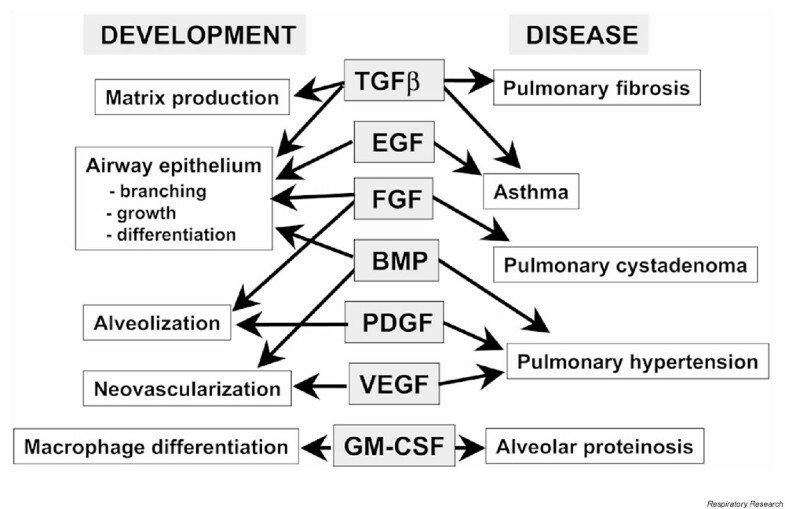 Growth factors are involved in virtually all aspects of lung development. During the initial stages of lung bud morphogenesis and subsequent formation of the bronchial tree, activation of FGF signaling in the epithelium by mesenchymal-derived FGF10 is critical . There is evidence suggesting that the spatial and temporal distributions of FGF10 in the lung determine the pattern of airway branching . Control of cell proliferation and cell fate of the nascent bud is dependent on the distal expression of BMP4, a TGFβ superfamily member whose expression is in turn controlled by FGF10 . Additional mechanisms stimulating growth of the epithelial tubules involve factors such as EGF/TGFα, hepatocyte growth factor, and FGF7. TGFβ1 opposes these effects. Its signaling is thought to prevent local budding and to maintain proximal airways in an unbranched form by suppressing epithelial cell proliferation and by promoting synthesis of extracellular matrix components around airways [1,2]. Some factors participate in more specific developmental programs, such as VEGF in blood vessel formation  and FGF7 in type II alveolar cell differentiation . During alveolization, one of the final steps of lung development, septation of the distal saccules to form the definitive alveoli requires FGF and PDGF signaling, among other factors [8,9]. Whether, and how, growth factors are implicated in the development of specific congenital abnormalities of the lung or in neonatal conditions, such as bronchopulmonary dysplasia, is not well understood. Some lung abnormalities found in human disease are also observed in genetically altered mice in whom growth factor expression has been disrupted. For example, transgenic mice expressing FGF7 in the distal epithelium exhibit cystic lungs reminiscent of pulmonary cystadenomas ; genetic ablation of granulocyte macrophage-colony stimulating factor in mice results in lungs with features of human alveolar proteinosis ; pulmonary fibrosis is observed in neonatal lungs of transgenic mice expressing TGFα in the distal epithelium . It is possible that these pathological conditions, in part, represent the manifestation of aberrant developmental programs that lead to altered growth factor expression or activity and generate signal imbalances. Studies in laboratory animals suggest that acute lung injury elicits growth factor responses that trigger repair mechanisms aimed at restoring lung integrity. For example, diffuse alveolar damage induced by hyperoxia in mice is acutely associated with increased lung levels of FGF7 and FGF2, which promote type II cell proliferation and facilitate repair of the damaged epithelium [13,14]. High levels of VEGF are found in lungs of transgenic mice overexpressing interleukin-13 . Interestingly, accumulation of VEGF in the alveoli appears to make these animals more resistant to injury by hyperoxia when compared with their wild-type littermates. In mice exposed to hyperoxic conditions, mortality dramatically increased when transgenics were pretreated with an anti-VEGF neutralizing antibody . Growth factor imbalances have been reported in various lung pathological conditions, although it cannot be known from these studies whether the imbalance is the cause or the consequence of the disease. Imbalances have also been described in chronic diseases of the lung in the absence of identifiable injuries. In some cases, growth factors mediate responses that actually amplify and propagate the initial damage. These events may represent a maladaptive response of the host to an original stimulus that 'primes' cells to subsequently respond abnormally. For example, lung fibroblasts from patients with silicosis treated in culture with tumor necrosis factor-α and TGFβ1 proliferate more and produce more collagen than cells from normal subjects . Patients with acute respiratory distress syndrome that are likely to develop chronic lung fibrosis show elevated concentrations of TGFα and procollagen peptide III in bronchoalveolar lavage fluid well before fibrosis occurs. This profibrotic milieu in the injured lung correlates with increased mortality . Similarly, high levels of TGFβ1 are found in bronchoalveolar lavage fluid of patients with systemic sclerosis that manifests with lung fibrosis . A model of growth factor imbalance in asthma has been proposed by Holgate et al. . They report that epithelial expression of the EGF receptor is increased in damaged airways of normal and asthmatic subjects. However, in asthmatics, the EGF receptor is also highly expressed in areas where the epithelium is intact. Interestingly, in airways of asthmatics under basal conditions, there is no evidence of epithelial hyperproliferation despite EGF receptor upregulation. Rather, structural changes are found in the mesenchyme, as shown by deposition of interstitial collagens and other matrix proteins in subbasement lamina. In these patients, while EGF levels appear normal, high levels of TGFβ1 have been detected in airway tissue and bronchoalveolar lavage fluid [19,20]. Suppression of epithelial proliferation and stimulation of matrix deposition suggest a predominance of the TGFβ over the EGF effects, as if airways are being held in a 'repair default'. The authors propose that this imbalance may represent abnormal reactivation of mechanisms involving epithelial-mesenchymal interactions reminiscent of those present in the developing embryonic lung . Disruption of growth factor signaling is also found in conditions that affect the lung vasculature. Genetic screening of patients with familial primary pulmonary hypertension reveals mutations in the gene that encodes the BMP receptor type II (BMPR-II) . The mechanism by which these mutations, in association with environmental factors, cause the disease is obscure; BMP signaling appears to be required to prevent uncontrolled proliferation and abnormal remodeling of the pulmonary vasculature. Another study in patients with pulmonary hypertension suggests that increased local levels of VEGF and its receptors in lung blood vessels may be involved in the formation of the plexiform vascular lesions characteristic of this disease . Paradoxically, an increase in the levels of platelet VEGF content is detected in patients undergoing prostacyclin therapy, which is associated with a significant improvement in their clinical status . Given the mounting evidence implicating growth factors in lung homeostasis and disease, could growth factor-based therapeutic interventions prevent damage or facilitate recovery by restoring or inducing an optimal balance of signals in the lung? Although still preliminary, there are experimental data that support this idea. A number of studies have shown that administration of growth factor prior to acute lung injury may be protective. Intratracheal instillation of FGF7 in rats ameliorates radiation-induced and bleomycin-induced lung injury, reduces alveolar damage by hydrochloric acid instillation, and decreases hyperoxia-induced mortality [24,25]. Such beneficial effects are likely to be secondary to FGF7 induction of alveolar type II cell proliferation and differentiation . In an experimental model of asthma induced by aerosolized ovalbumin, pretreatment of mice with dexamethasone, a synthetic adrenocortical steroid, fully inhibits the inflammatory response and airway hyperreactivity, yet airway remodeling is only partially inhibited . Addition of EGF to scrape-wounded bronchial epithelial cell monolayers accelerates repair, whereas dexamethasone treatment has no effect . This raises the possibility that exogenous EGF could be used to regenerate the injured epithelium in conditions such as asthma and potentially prevent airway remodeling. It is important to point out that growth factor function is regulated not only by modulation of ligand availability, but also by the coordinated presence of their receptors, positive and negative signal transduction proteins, and downstream transcription factors in target cells. Additional levels of complexity include modulation of function by extracellular matrix components and interactions with other growth factor pathways. A better understanding of how these factors act in the lung under normal and pathologic conditions will provide a stronger rationale for their use in specific therapeutic interventions and minimize the adverse effects of less focused treatments. Whether growth factors act as friends or foe in lung development and lung injury depends on their presence at the right time, in the right place and at the appropriate level. Growth factors are necessary for normal development and homeostasis, but it is always possible to have too much of even a good thing. This work was supported by a grant from NIH/NHLBI (PO1HL47049).